After the death of Margaret Thomas, one of the founder members of our Society, we were contacted by her daughter Janet. Amongst her mother’s many books and papers there were some that Janet thought we would appreciate. Many heavy parcels then made their way to Winsford and into our archives. Months passed and we were once more contacted by Janet to alert us to the existence of a letter from Mr. John Henry Cooke, Solicitor and Clerk to Winsford Urban District Council. He had written to the new Chairman – Mr. Parker – his version of events reminiscing on 50 years of progress in the town. Janet had sent this to the Cheshire Record Office but thought that we would want to know of its existence. A visit to Chester and hours of further research resulted in the following article. It serves to remind us how important it is to treasure the letters and memories our ancestors leave behind and what an important resource for social history they are. In his letter written on 7th September 1925, John Henry Cooke recalls some of the events during his time with the Local Board and later the Urban Council. He was a local solicitor but, on the 7th September 1875, he was elected as Clerk to the newly formed Winsford Local Board. His letter makes interesting reading and has provided material for further research. Who owned Breeze Hill? If we look at the 1871 census we find that the occupant of Breeze Hill is Thomas Bradbury aged 67. He is a manure merchant from Market Drayton and lives here with his wife Elizabeth E Bradbury aged 44 from Winsford. They have two servants – Alice Tomkins, aged 26, domestic servant and cook from Malpas and Ellen Tomkins aged 19 housemaid also from Malpas. The name Bradbury is well known in Winsford because of Lord Bradbury who was Joint Permanent Secretary to the Treasury from1913 to 1919. During that time he was responsible for issuing the first treasury notes which, because they bore his signature, became known as ‘Bradbury’s’. So was there a connection? Going back to the 1861 census we find that Thomas S Bradbury is married to Elizabeth E and is living at Clive House, a farmer of 122 acres employing 3 labourers and also a bone manufacturer. There are three cousins – Walter Bradbury, Mary E Bradbury and Honor Bradbury as well as 6 other people living at the same address. Further research reveals that there is indeed a connection to Lord Bradbury. Thomas S Bradbury was the son of George Bradbury and Ann Swanick and is the brother of John born in 1811. John is the father of Lord Bradbury who is therefore the nephew of the owner of Breeze Hill. A search on Ancestry revealed an extract from the diary of George Bradbury (1797-1890) written in 1885 referring to his son Thomas ‘After a time in the Manchester Trade and representing the celebrated corn law repealer Richard Cobden, he took the Bone Works at Winsford and the farm at Clive.’ Thomas died in Cheltenham on 30th September 1880. However it would appear that Breeze Hill was unsuitable for their needs as the letter continues – ‘The Town thought this a very unfavourable position’. Unfortunately there were a great many cases of smallpox at this time and the need for an isolation hospital was urgent. 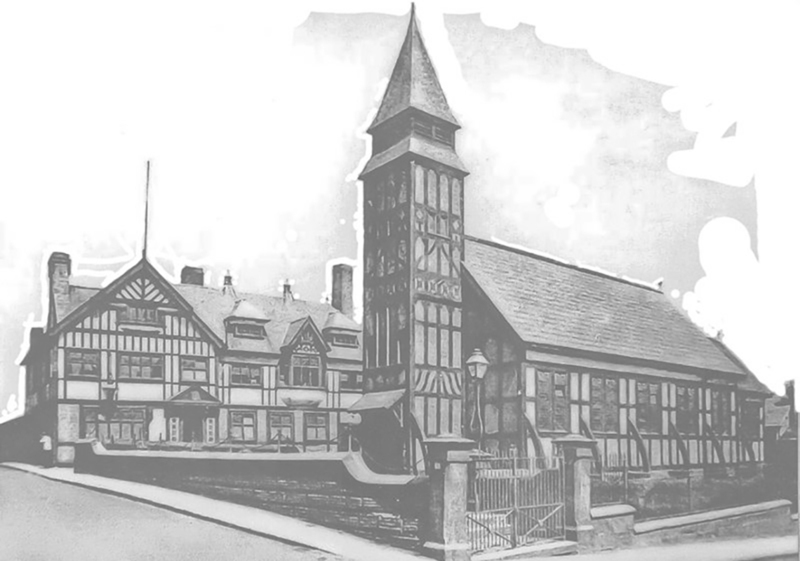 The minutes of the Local Board inform us that a letter was received on June 30th 1876 from Mr. Cheshire, the Clerk to the Northwich Board of Guardians, stating that the Winsford Board could have use of the Fever Hospital at the Leftwich Workhouse on the payment of 15/- per week for each patient to cover the cost of maintenance, medical attendance and medicine. There was obviously no end to his generosity as the letter continues by offering ‘the use of the fever van when not already in use, on applying to the master of the workhouse and paying 20/- per week per patient’. The Board were however required to find – at their own expense – ‘a horse and a man to drive the same and to be answerable for any damage that was done to the same.’ It was hardly surprising to read that very soon after this a proposal was put to the Middlewich Board ‘as to a Fever Hospital to be used jointly by the ratepayers of the two districts’. John Henry Cooke’s letter then further outlines the state of Winsford in the 1870s and the need for fresh water and improved street conditions. The reference to Wombwell intrigued me and led to further research. George Wombwell, born in 1777 near Saffron Walden, was a famous menagerie exhibitor who founded Wombwell’s Travelling Menagerie. In 1804 George was a shoemaker in London but, after buying two snakes from the London docks and making a profit exhibiting them around the taverns of Soho, he decided that there was a possibility of making a fortune with exotic animals. He soon collected a large number from all over the world and in 1805 founded his travelling menagerie. By 1839 it totaled 15 wagons and was accompanied by a brass band. Wombwell died in 1850 and the company was run for the next 16 years by his wife. Later it was passed to his nephew who auctioned it off in the old Waverley Market in April 1872 for a staggering sum equivalent to £250,000 in today’s money. Unfortunately Mr. Cooke’s letter does not give the date for the visit to Winsford.